Narendra Modi did something out of the blue but for a good cause. India’s Prime Minister Narendra Modi has offered $154,083 (10 million Indian rupees) to Edhi Foundation for taking care of Geeta - a deaf and mute young Indian woman - who had mistakenly crossed border more than a decade ago. "I don't think any amount of words is enough to thank the Edhi family for taking care of Geeta. They are apostles of kindness and compassion," Modi said in a series of tweets. "What the Edhi family has done is too priceless to be measured, but I am happy to announce a contribution of 10 million Indian rupees to their foundation," he added. The Indian prime minister also welcomed Geeta on her return to India and expressed his gratitude to Prime Minister Nawaz Sharif for his efforts that ensured Geeta's return to India. 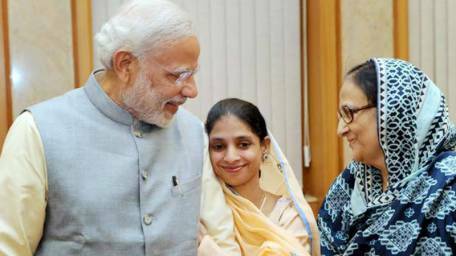 Geeta’s story got fame when the indian movie Bajrangi Bhaijan got released. She was related to the film’s story and philanthropists along media made efforts for her way back to home. Geeta’s DNA test was due and after the affirmation, she’ll be handed over to her family. Indian PM’s gesture of goodwill is highly acclaimed, this also depicts his vision towards Pakistan. It is necessary to mention here that a series of Profile for Peace was started in favor of promoting peace in both the neighboring countries, after Shiv Sena attacked PCB’s chairman and threated Pakistani artists. I don't think any amount of words are enough to thank the Edhi family for taking care of Geeta. They are apostles of kindness & compassion. What the Edhi family has done is too priceless to be measured but I am happy to announce a contribution of Rs. 1 crore to their foundation.